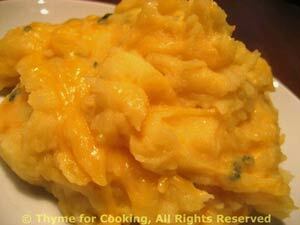 Cheddar Mashed Potatoes, Thyme for Cooking potato sides. Lightly stir the shredded cheddar into the hot potatoes just before serving; some will melt into the potatoes giving them a lovely golden color, some will turn into trails of molten cheese. When boiling (and pay attention or they will boil over) reduce heat and take cover partially off. Continue cooking until done, 15 - 20 minutes. They should be very done, easily coming apart when poked with a fork. Add half the cheddar and stir well. Add the remaining cheddar and stir lightly.